I had been looking for chairs for the table we bought last October (from Ikea) ever since then. Well, I finally found some chairs. In July, we were yard sale shopping and I found a set of 4 chairs with an alder table all together. I didn't need the table, but thought I could refinish the top and maybe sell it or something (the top was really needing to be refinished, it was scratched, drawn on with permanent marker, etc...). I guess that the table grew on me, because now it is in our kitchen! First we sanded the top and re-stained it. 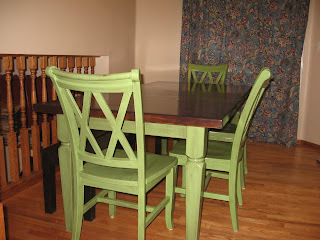 Then I took a break from the table and painted the 4 chairs. We have been using the chairs for about a month. I finally decided to finish the table, so in the last 2 weeks, I have been priming, painting, and sealing the table legs. I finally finished, and now we have a fantastic new kitchen table! I'm so happy with how it turned out. 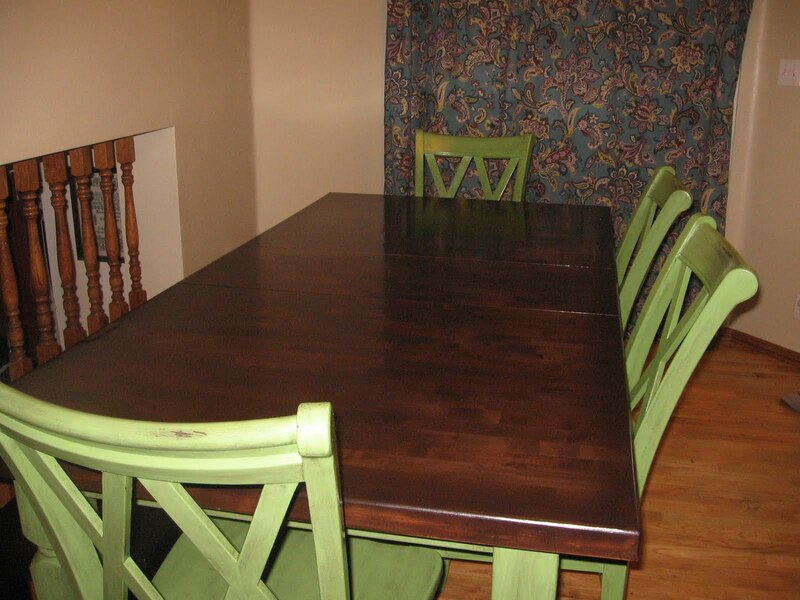 The table is stained with a mahogany stain, and the chairs and legs of the table are painted green (obviously) with a glaze over to antique them. I love it. We forgot to take before pictures but the table top was only polyurethaned and the legs were red. The chairs had a natural wood seat, the rest painted red. They actually didn't look bad, but I liked the green better. It was a fun first refinishing project for me. I love it! The table and chairs turned out so nice!